We made it! We’ve come to our 3rd and final recipe for Shudder‘s The Last Drive-In! We think this one is pretty fantastic though it definitely took some work (we actually shot this one twice!). 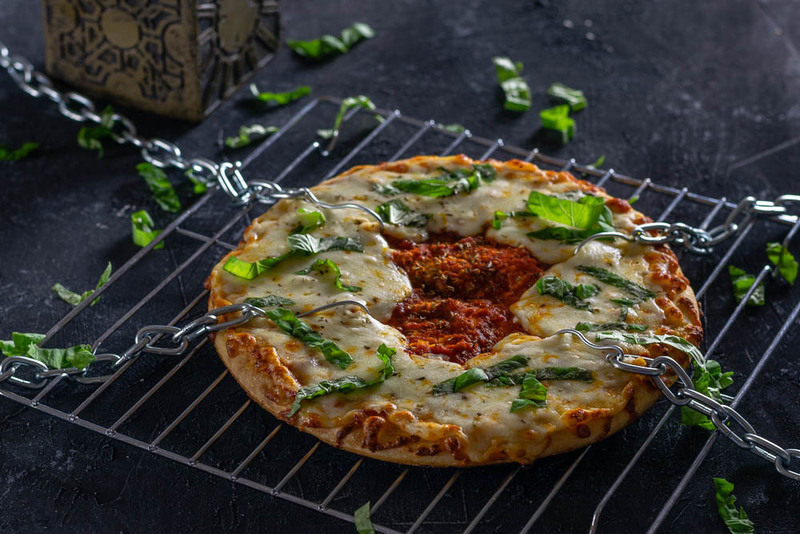 This time we’ve created a pizza recipe, Pinhead’s Pizza, inspired by Cliver Barker’s Hellraiser. In the words of our friend Johnny, we have such bites to show you! After creating our recipe for Puzzle Piece Pizza for Jigsaw we’ve been itching to do another pizza recipe. Hellraiser seemed like a fun fit for this. Hooks and skin can be recreated pretty easily with melting cheese. The fun thing about Pinhead’s Pizza is it can be created in either a full size pizza or in an 8 inch personal size pizza. We topped ours with cheese and fresh basil. You don’t want to put too many toppings on this or it will lose it’s “skin look”. The chains we used were 12 inch cuts of chain from Home Depot and were less than a dollar a foot. We made the hooks from framing wire. All in all it is a pretty cool effect and highly customizeable. There you have it! We’ve given you 3 new recipes perfect for The Last Drive-In. Speaking of which, The Last Drive-In will air on Shudder TV on Friday the 13th starting at 9 pm EST/6 pm PST. Make sure you head over to https://www.shudder.com and get signed up! Also, if you want to interact with other marathoners, Joe Bob Brigg and crew have set up a Slack Chat! You can sign up here: https://tinyurl.com/Thelastdrivein. Don’t forget, if you decide to make our recipes be sure to tag them with the hashtags #GeekEats and #JBBonShudder! The Geeks have such bites to show you! 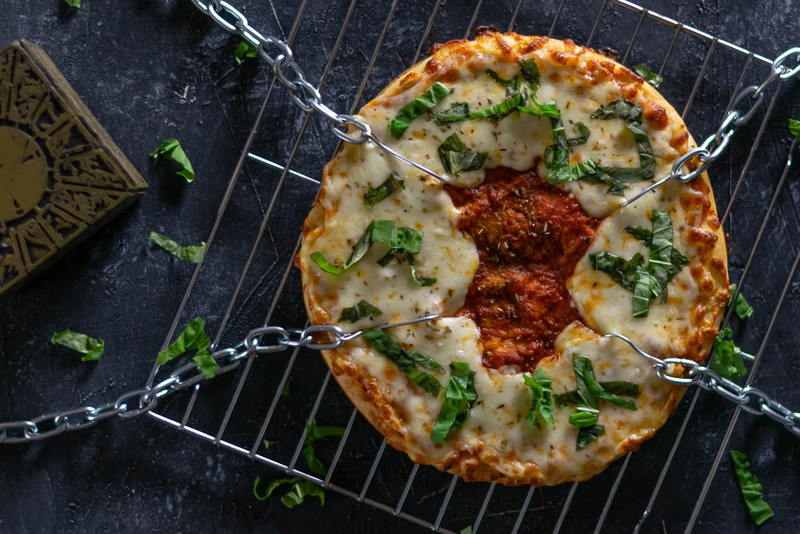 They've created a recipe perfect for movie night, Pinhead's Pizza, inspired by Clive Barker's Hellraiser. Arrange cheese leaving the center (or anywhere you want "the skin" to look torn). Quantities will depend on the size of your pizza. Generally, one package of everything will be more than enough. The chains used in the photo were purchased at Home Depot in the bulk chain section for about $1 per foot. These definitely help set the tone with this recipe. This is some scary pizza! What fun this must have been to make AND eat!